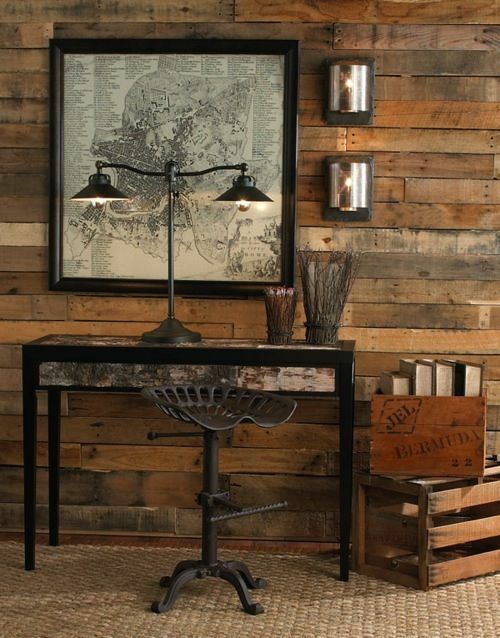 What to do with old magazines was one of the top searches to my blog last year. Since I wrote the original post, my readers have multiplied almost tenfold, so I think it's time to come back to the topic. 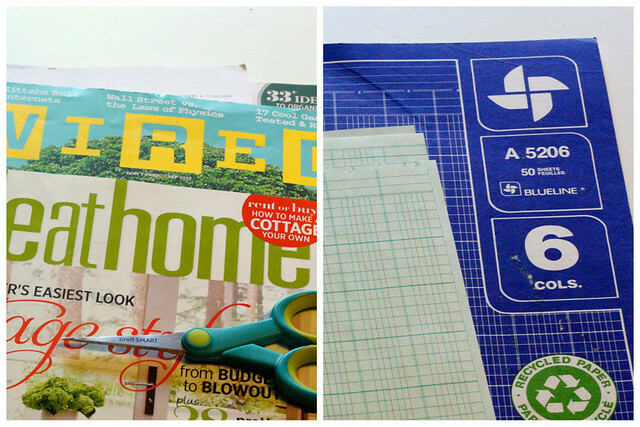 I still love magazines, but I am determined to put them to good use as much as I possibly can. This is of course once I've read and saved the parts that I feel need saving. I still use them to the same purposes as before, but I am convinced I can come up with more uses. I'll report back here every time I do. 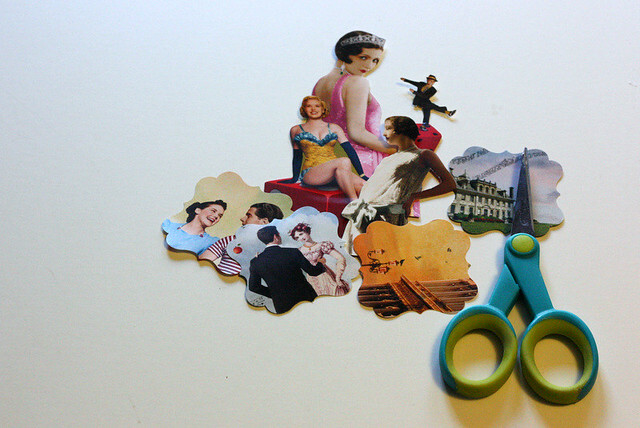 You'll need old magazines, scissors, paper (any boring old paper will work, it won't be boring for very long) and glue. 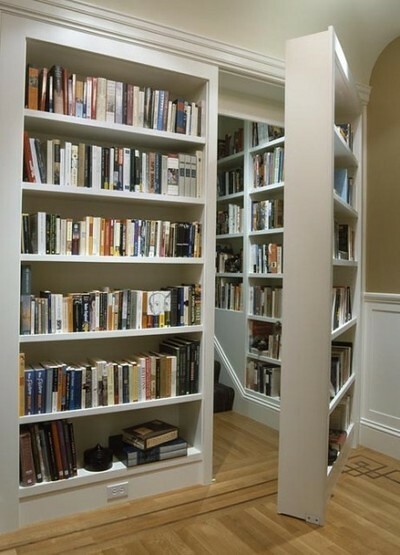 So, start by flipping through the magazines for pictures you like. It could be anything! 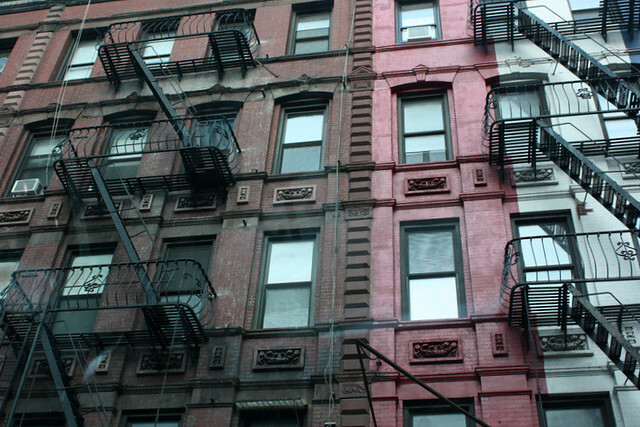 Maybe a photo or a drawing, a funky pattern or just a color you really like. Cut out the part you like. Experiment with different styles, cut some out exactly at the outline and others maybe into shapes. If you have a paperpunch or a few, use those too! 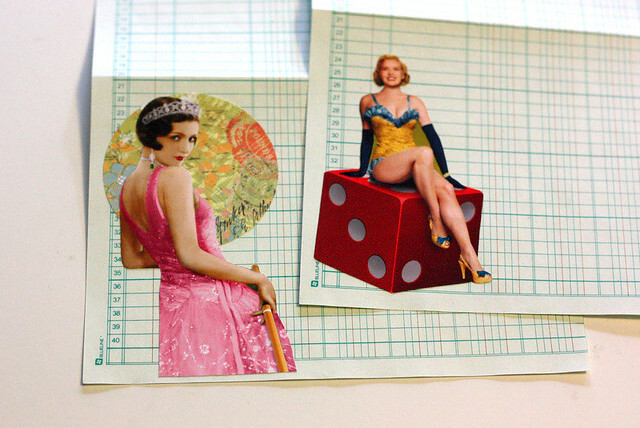 Once you have some of your pictures cut out, cut your paper into the right size if needed. I'm sure some will work just as they are, others you might want to cut a bit smaller. Remember: any paper would really work as long as you can write on it. I think this is the perfect way to use those last pages of notebooks, especially the school ones, or ever printing paper. The point is really to use whatever you have at home. I made mine from vintage ledger paper. 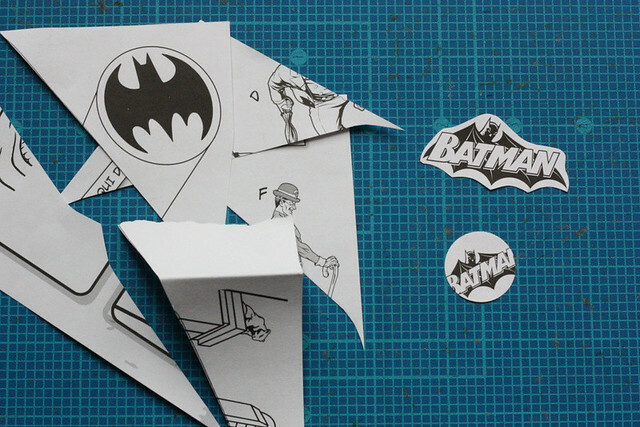 Then finally glue the cutouts to your paper. I would recommend putting the sheets under a bit of weight while they dry, just to make sure they stay flat. If you're going to make this project, please let me know. I'd love to see your versions! I'm feeling extremely productive right now and am creating more stock for the shop. I've also been experimenting with some new products and have finally picked the ones I am the most proud of. There will soon be two new types of stickers available in the shop! I just really wanted to share a sneak peek with you guys since I am so excited! 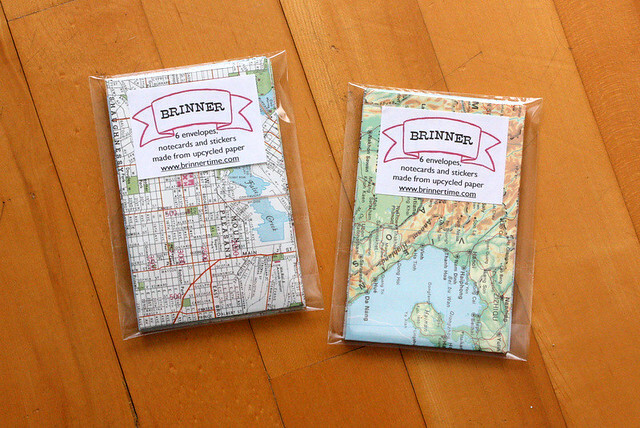 These new sets are made from upcycled paper as always and I just love them all! I'll show you the full sets and the inspiration behind them soon. Right now I need to finish a few new sets of envelopes and then set up for photos for the new stickers. I'm just so happy how these turned out! I had such a lovely weekend out of the city. I went skating and spent more time outdoors than in a long, long time. There was absolutely no connectivity whatsoever, no internet or even phone coverage. It was a nice change. I will answer your comments and e-mails soon! I have some really nice photos from the trip too, so I'll share some with you guys later this week. On the mail front it's been busier. I actually had a few outgoing packages this week! I sent a few others as well, but to be honest with you, they weren't anything new. You've seen similar so many times already. I was working on something in a new style this weekend, but it's not completely finished yet, so you can see it next week. Such awesome mail from Jess! 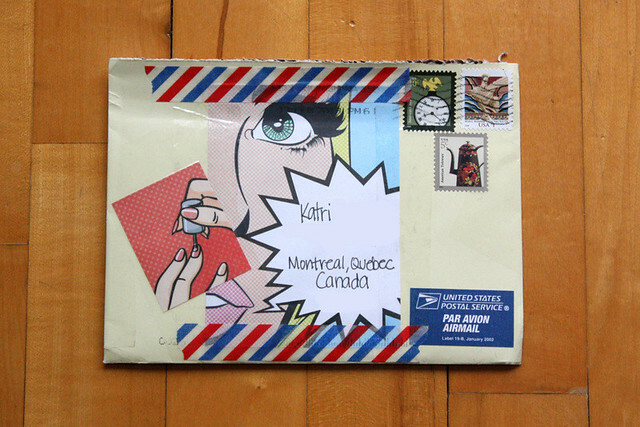 Look at the comic-book-y, pop-art-ish envelope! How cool is that! I've been good again obviously! 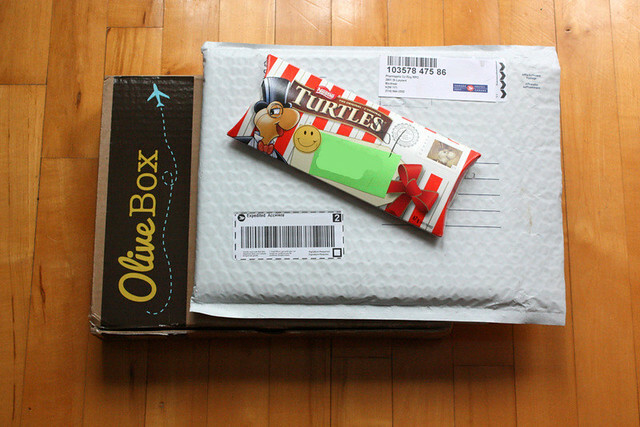 Packages all kinds, my February Olivebox subscription, a surprise package with cartoons and a magazine and some chocolates to top it all off. Such perfect things, I love them all! Thank you so much guys! Guys, I'm so excited to share these photos with you! 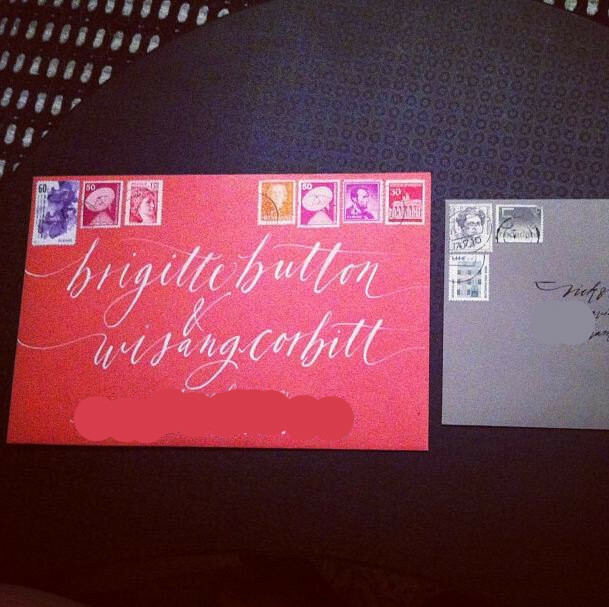 These are the wedding invitations Jess put together for her wedding. When I see this kind of awesomeness I love what I do so much more! It was such a fun project to work on. 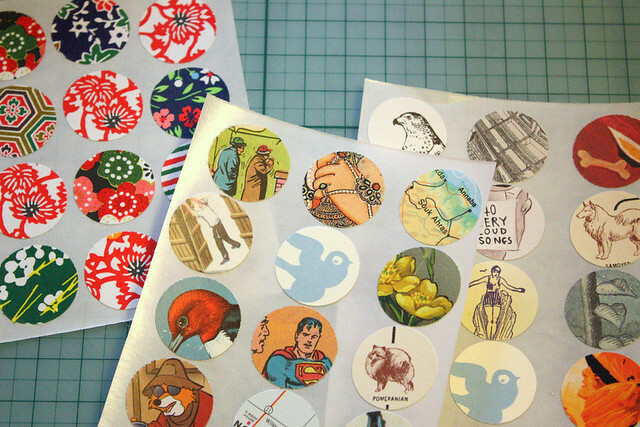 Jess contacted me about the stickers I make from used postage stamps. We brainstormed on the right color scheme and here is the final result. Aren't they gorgeous? The lettering is beautiful as well. Unfortunately I had to cover some of it to keep the privacy of the recipients, you get an idea with the names already. So beautiful! Amazing job you've done here Jess! I bet your wedding will be incredible! P.S. The ring is gorgeous! This is actually a fun little project, and super cheap, that I came up with quite accidentally. 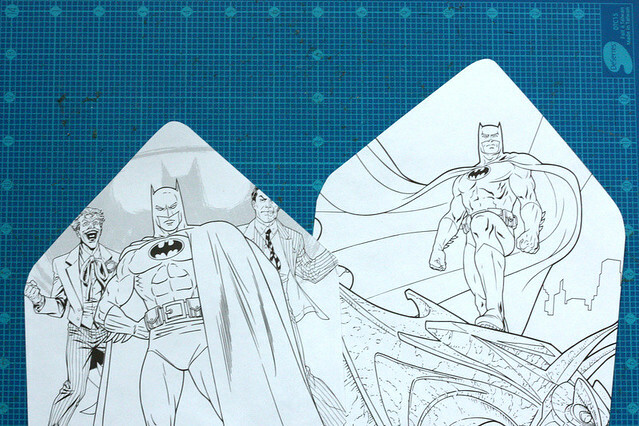 Let me tell you how I became to own a Batman coloring book. I have awesome friends and some of those said friends are totally cool with (or in tune with their inner/outer nerds) liking awesome things like Batman. So, as it happens I went to Dollarama (I can't tell you often enough how much awesome stuff they have, seriously) to look for bubble-wrap and saw these glossy and awesome Batman booklets over at the kids section. I open one of them and find it's a coloring book and, more importantly, it comes with stickers. Immediately I'm thinking of Mary and decide to purchase this booklet so I can send her Batman stickers. The sheet of stickers was too large to send in one piece, so I sat down to start cutting them into smaller pieces. As I was doing that I realized I could use the pages and covers too... And I realized tht there are two other peeps I know who would totally appreciate superhero mail, Sanna and Erli. 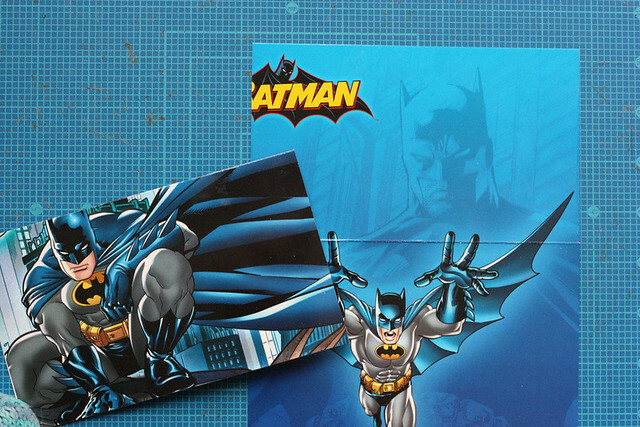 So, I ended up making two lined envelopes, two cards and some Batman confetti. This is how you can make something similar as well. 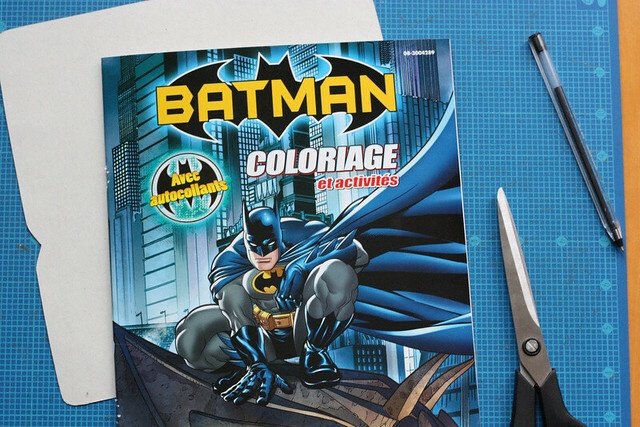 Take the booklet apart carefully, you'll want to keep the pages fully intact, not cut in half. This shouldn't be hard as the cheap-o dollarstore booklet was stapled together. 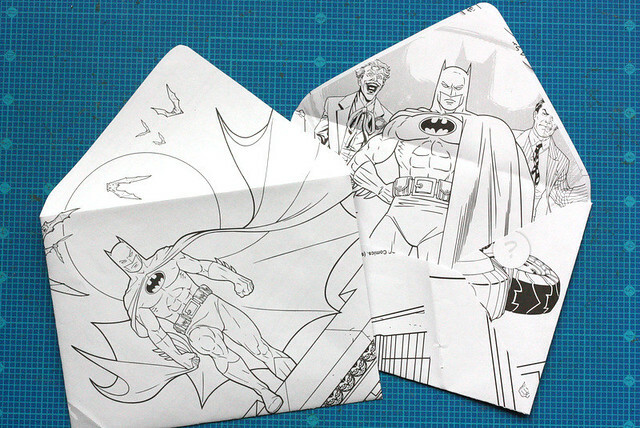 Cut the pages into envelope shapes**. 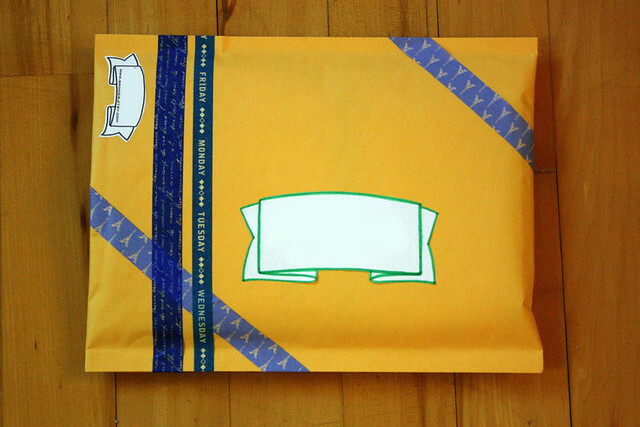 You can use an envelope template to do so. 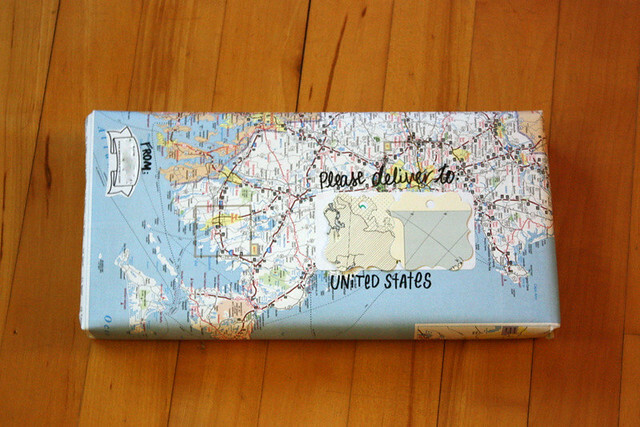 To learn how to make one yourself, check the envelope template tutorial HERE. **Note: Pick the pages for the envelopes first. You'll need, not only bigger pictures, but the ones that have a focus on the middle of the page. Then you can pick the best ones from the leftovers for the lining. 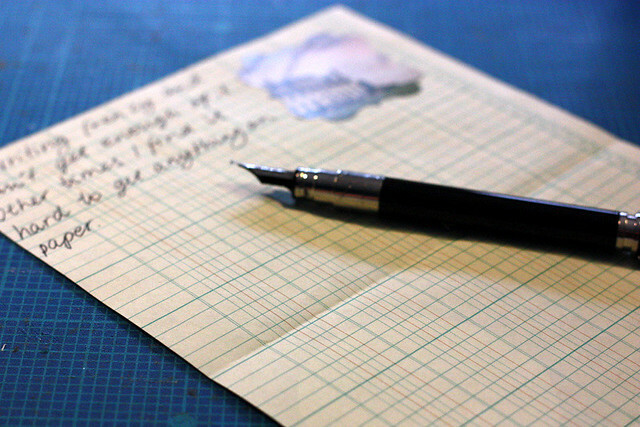 Would you guys want an envelope making tutorial as well? A kind of a basic how-to which you can apply to a whole lot of other projects? 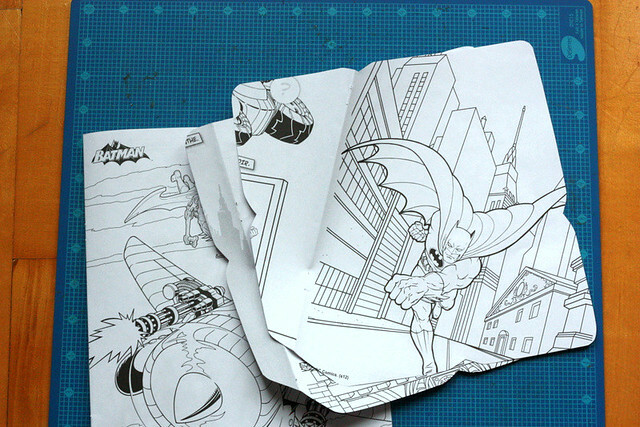 Cut the covers of the coloring book into cards. Finally, cut any leftover paper snippets with cool pictures into confetti to stuff the envelopes with. And of course, no comicbook-superhero-snailmail-awesomeness is even complete without a speech bubble address label. Drawn on paper and glued on the envelope. 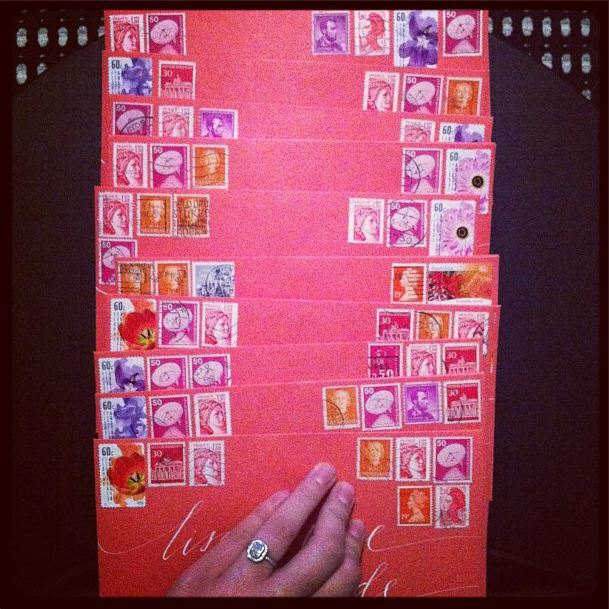 Now, tell me is this the coolest, most awesometastic snailmail DIY ever??? Geekiest for sure!?! 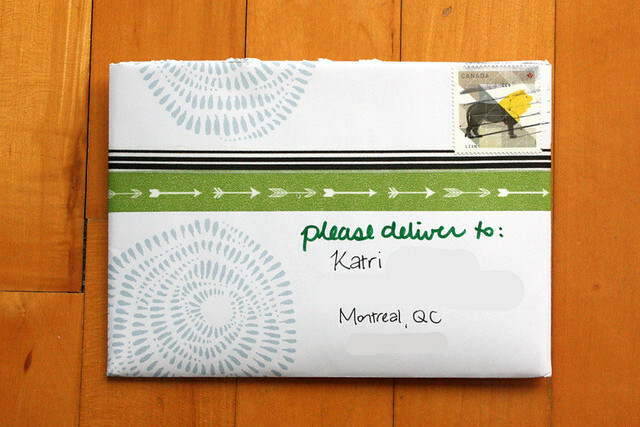 Edit: added a link to the envelope template tutorial. 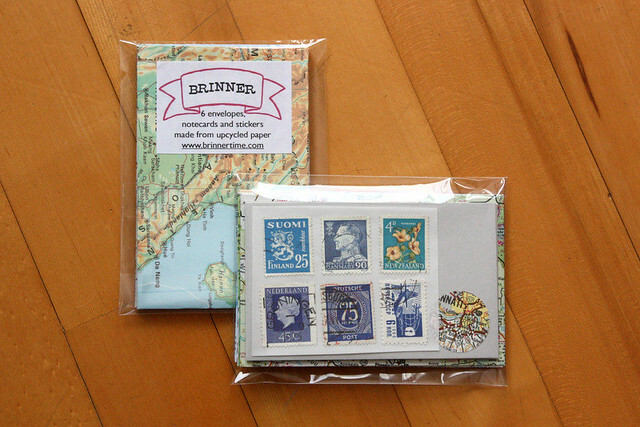 I have gotten back on the proverbial saddle when it comes to outgoing mail. One thing I just noticed when I was editing the photos for this post; I almost always take a photo of the incoming mail before I open it. Somehow it made sense to me. This week, both of the letters were opened before I took the photos. Usually I take my time when I receive something. I might make a cup of tea first or at least make sure I have time to read them properly. This week I felt like I needed the distraction immediately. So, this time the letters were read first and only then photographed. Do you think the order makes any difference? Just yesterday I showed you some of the books I found recently and mentioned how I wanted to make dessert envelopes... Well, I really, really wanted to make them, so here's the first one already. I will actually make a set or two for the shop soon, so you can soon mail some pastries too! 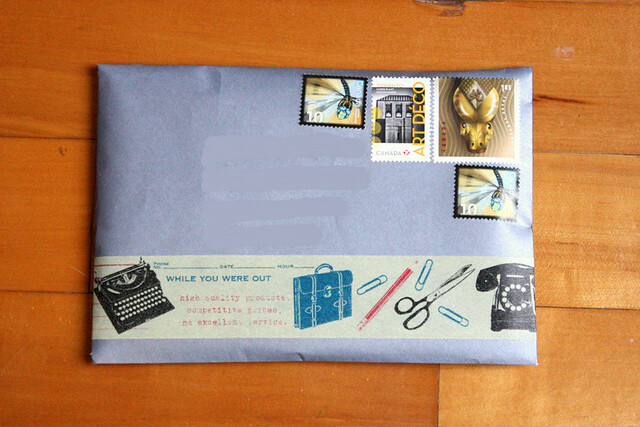 A silver envelope decorated with the new washi tape I bought from my recent trip to New York City and a new art deco stamps I finally received from the post office. There was also a few other things going out that I felt didn't need to be added to this post for various reasons. 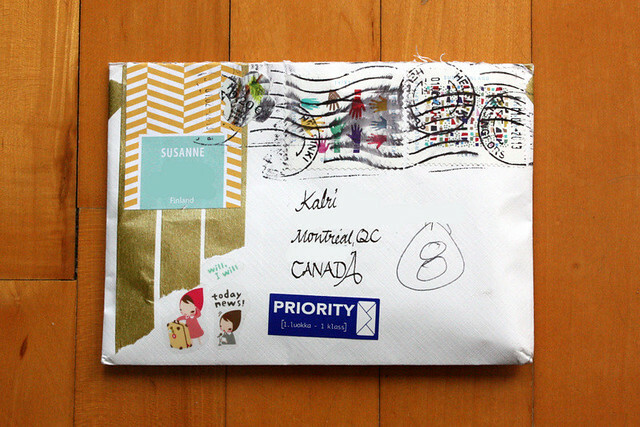 A lovely letter from Susanne with pretty handwriting, nice stamps and, of course, Korean stickers! This green hued guy is from Laura. I really like the tapes! I haven't shared any thrift shop finds in a long while. Partially because I haven't spent much time treasure hunting and the times I have gone, I haven't found anything interesting enough to share. 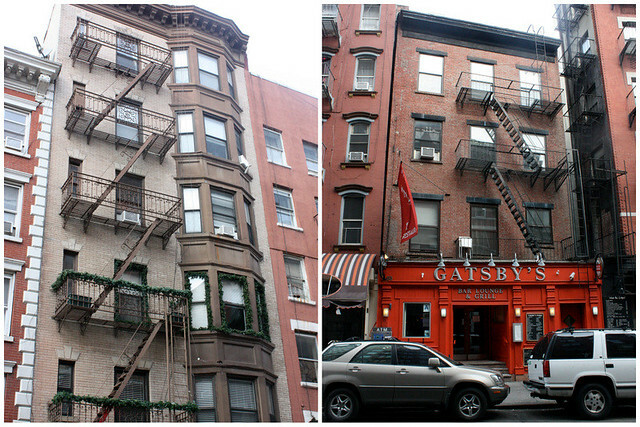 Last Friday I felt like I needed a little break and took an afternoon off from my usual schedule to go for a walk. Somehow when I decide to "go for a walk" I end up at a second hand store or a thrift shop. I don't know how that happens, a total mystery. (Does this ever happen to you?) I think it helped that I hadn't been to my regular shop in a while, because I found some pretty neat things. 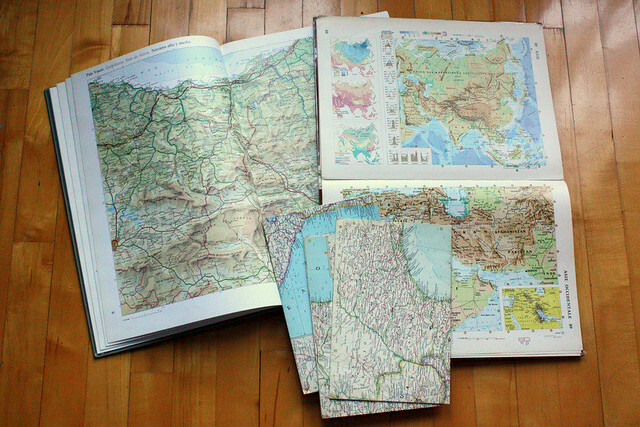 Two vintage atlases and some old maps. The maps are especially nice find and I already have a use in mind for them. I'll share it with you guys once I've finished. The larger of the two atlases is a Spanish one from 1992 and the real treasure is a French atlas of the world from 1978. 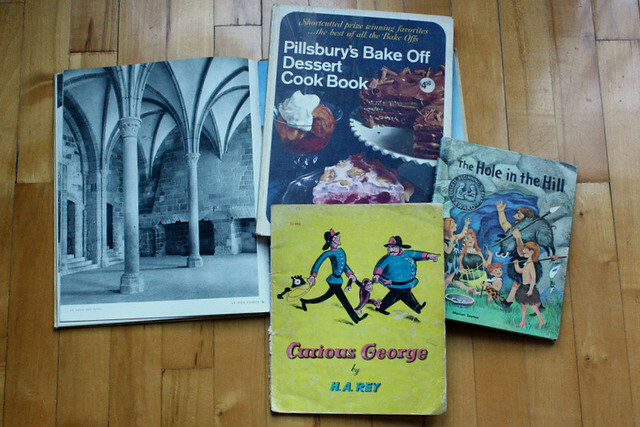 I also found a few other books, "Curious George" and "the hole in the hill" as well as a Pillsbury dessert cookbook from 1968. The photos in the book are awesome. As much as I'm tempted to try some of the tasty-sounding recipes, this book will be made into envelopes. 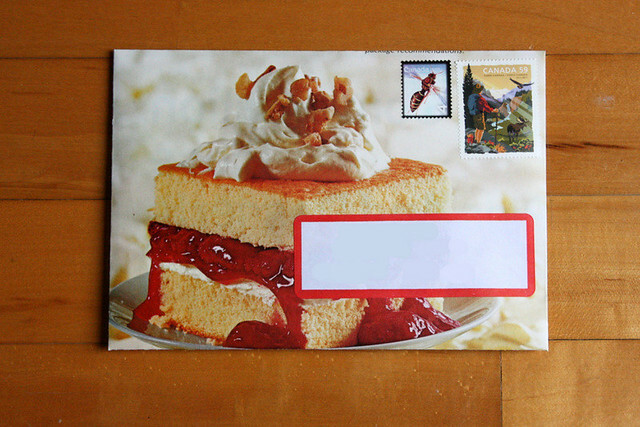 How much fun would pictures of pies and pastries be in your mailbox? The last treasure is a picture book of Mont Saint-Michel. It's absolutely beautiful with large, high-quality photos of the details of the castle. It's falling apart pretty badly, but I can make such beautiful things out of these pages. I'm really excited! 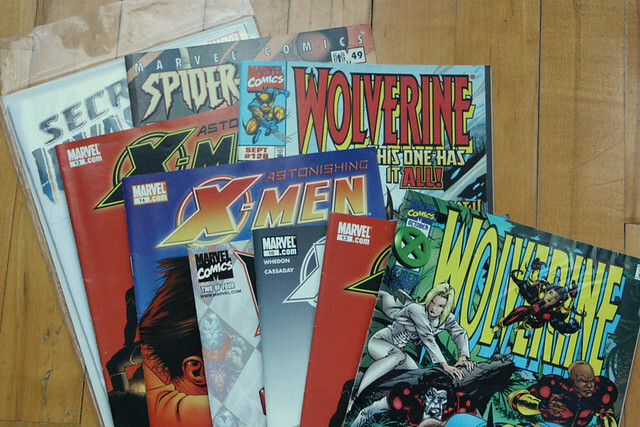 Finally, I couldn't resist cheap comic books. With 25 cents a piece, they were a steal. I grabbed a few that I think I'll read first and then see what I might make out of them. Have you found anything fun recently? Due to popular demand* here's finally a great recipe for impressive looking but really easy to make meals! Man, I love quinoa. I know it sounds totally hippie and all, but it's seriously such an awesome ingredient. I know, I know, I'm really late on the quinoa bandwagon (foodie-fail), but better late than never, right? I like to make a huge pot of it and then throw in different things to make separate interesting meals out of basically the same thing. It's like using a base and then masking it with a whole bunch of other stuff. Like the LBD of cooking. So, this is one of those really easy recipes. I used cups for the measurements as I am in North America after all, but use the same formula whatever your unit of measure is. It could be an actual mug, you know. Just use the same one for both measurements. First, put the liquid of choice in a large pot (remember, quinoa swells quite a bit) and put the broth/water to boil. Like said, you can use any kind of a broth or water. If you use water, drop in a bullion cube or a dash of salt. While the liquid heats up, rinse your quinoa. I've read from various places it can be bitter tasting if you don't. Now, I've never tasted bitter quinoa, so I don't know, but better safe than sorry. If you have a mesh strainer, you're already ahead of me. I have one but the holes are too big. (You might want to check before you pour the quinoa in, otherwise you'll get a drain full of quinoa. Those little buggers are tiny.) If you don't have a strainer, just use a tupperware container. Dump in quinoa, add water and swirl around for a bit. Drain water and repeat. Once the liquid is boiling add in the quinoa and turn the heat to low. Let boil for 15 minutes. Once the 15 minutes is up, check how much liquid is left. There should be a little bit, but the grain should not be floating. if it looks completely dry, add a little water. Then set aside for 5-10 minutes. The quinoa is ready once the grains seem plump and all the liquid has been absorbed. I read somewhere you can actually make quinoa in a rice cooker as well. I haven't tried this, but the 1-to-2 ratio should work here too. 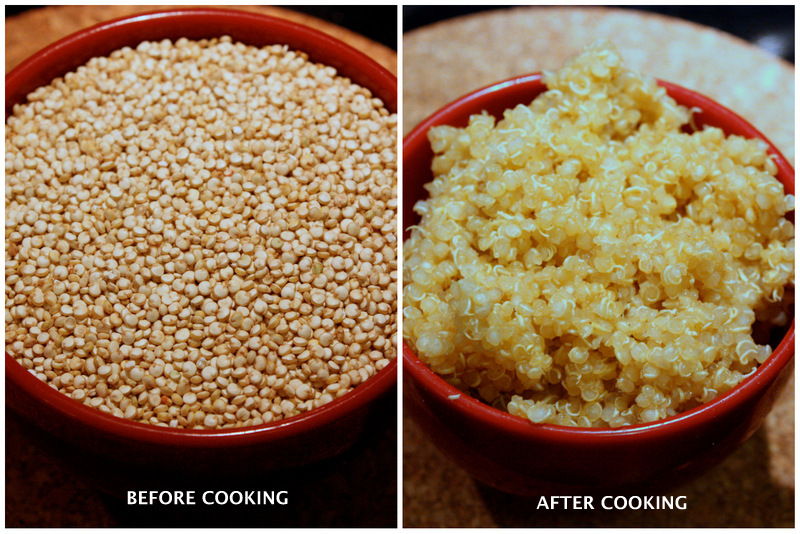 Let the quinoa cool before mixing in the ingredients if you're making a salad. 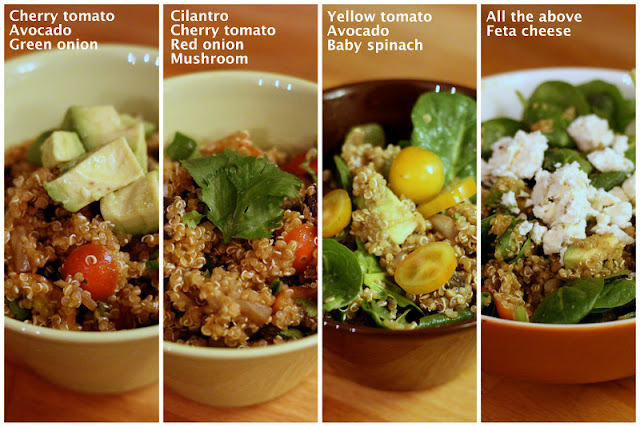 Obviously, you can use any dressing you'd like, just mix it in the cooked quinoa. Super-tip: ready salad dressing, like Italian dressing, cuts down at least 5 minutes! I'd be careful with a creamy one, pick a vinegar/oil based one to make sure it stays good. Super-pro tip: Keep the quinoa at this stage in the fridge until you want to eat it. You can make several meals with this base and just change the ingredients! It's really easy to make into lunch by adding a little extra dressing and a few varied ingredients. That way it'll taste different for the different meals. You could even divide it into smaller containers for extra fast lunch. Then, the fun part. Add a bunch of tasty ingredients. My favourite combo is cherry tomatoes, avocado, bocconccini (mini mozzarella) and cilantro. I've also tried tomato-fresh spinach-feta cheese. Basically you could put in anything you'd put in a salad. Next one I'm thinking of is pear and feta cheese. Keep in mind that these are just the salad-y ideas. There's a whole lot of different things you can use quinoa for, including warm dishes. I'm pretty sure it would taste awesome with curries and stews. This recipe was put together by trial and error and by combining instructions from all over the interwebs, for example theKitchn and FamilyFreshCooking. Once you have the basic idea down, the possibilities are endless. What would you add to quinoa? I'd love to try your ideas, so please leave a comment! Today is the first Market Cooperative. "Montreal’s Market Cooperative is a community market held on McGill’s downtown campus. We bring together the McGill and Montreal communities by showcasing local artists, musicians, and people with great ideas. Come to our very first Marketplace, on February 14th, in the SSMU ballroom. See you there!" I'll be there with a whole lot of other amazing Montreal talent. If you get a chance, please drop by! Let's spread the love on Valentine's day! Well, now's your chance to get one without breaking the bank. I found another good deal from our friends at the Plaid Barn! Do you remember, that's the daily deal site I've mentioned twice before? Anyhow, I just thought today's deal was pretty cool. You can get your own rubber stamp. I've been thinking about getting one for a while, so I'm definitely getting this deal. It's only $5.50 + shipping and you can customize it up to 8 letters. So, you can get your name, initial or just one letter. Again, my plan is not to spam you with advertisements here, but share a good deal if I find one. I thought this one has a lot of potential... Just imagine how easily you could add your name on your snail mail. Meager Monday Mail more like it... Well, took me long enough to get my letters on their way, so it's more than fair for me to wait! I'm currently preparing for an event on Valentine's day, so my home is once again filled with paper scraps. One piece of mail. 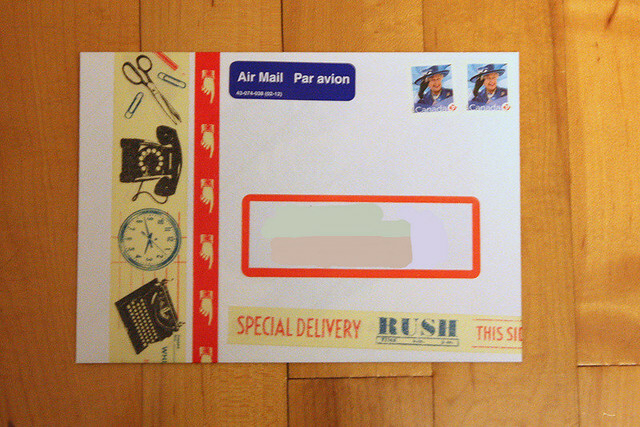 It has a bit of an old school airmail theme. 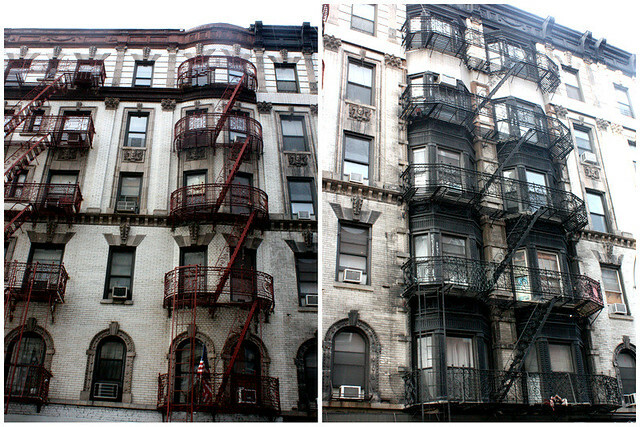 Photo's terrible though, it was a bit of a rush, so I didn't have time to wait until the light was better. 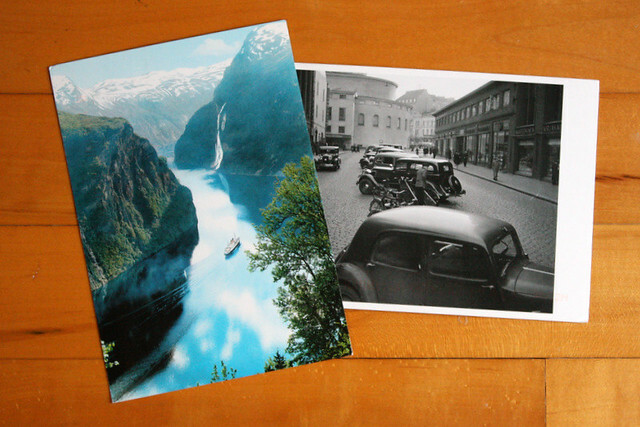 Two postcards on the same day! One from Norway and the other from Helsinki! Thanks!